Jamada Chebet the Assistant Warden in charge forest restoration at Mt. Elgon National Park leads tourists through the park forest. Photo by David Oduut. 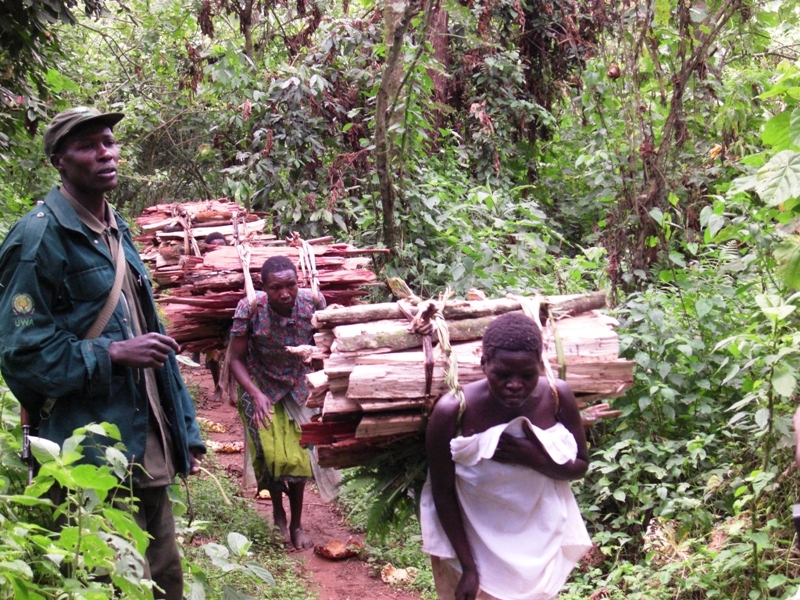 A long-running conflict between man and the environment looks set to end well with communities in Bududa District coming together with Uganda Wildlife Authority (UWA) to restore the badly degraded vegetation around Mt Elgon National Park. Over the last two decades the park has come under sustained pressure through encroachment by the people. Land remains a precious resource in Bugisu whose mountainous topography means access to fertile land is limited. Mt Elgon National Park is home to over 300 species of birds and animals, including the endangered Lammergeyer. Small antelopes, forest monkeys, elephants and buffalos also live on the mountainside. Besides the fauna and flora, the park offers a variety of attractions including cliffs, caves, gorges, waterfalls, hotsprings, mesas, calderas and the mountain peaks. 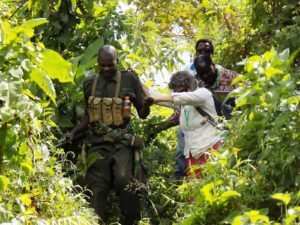 UWA ranger helps a tourist to wade through part of the recovered forest at Bubiita range in Bududa district. Photo by David Oduut. There has been continued degradation of the Mt Elgon ecosystem mainly brought about by clearing of land for agriculture, coupled with poor agricultural practices and increased cutting of trees. This has always posed a danger to tourism in the park which now attracts over 4,000 visitors annually. At the height of most destructive encroachment, the park lost over 3,000 hectares of forest cover, a catastrophic occurrence which UWA blames on politicking during the 2006 election campaigns. Locals were both encouraged and allowed, by self-seeking politicians, to clear chunks of the park land for farming. Jamada Chebet, the assistant warden in charge forest restoration here, told PML Daily that UWA has he since then been providing indigenous tree seedlings to local farmers planting. The farmers maintain the saplings for five years as part of the collaboration on regeneration of indigenous tree species. At least 3,220 farmers have so far benefited from the project while in Bubiita range, six-year-old indigenous trees are flamboyantly closing up canopy, which is a clear indication to the remaining local farmers to leave. “There was food shortage in some of these communities before UWA intervened by allowing them partial access to carry out regulated farming in the park,” Imran Muluga, the Bududa Resident District Commissioner, said. Firewood is now havested on supervision from UWA. Photo by David Oduut. This and other interventions, he said, had helped ease the once strained relationship between UWA and the communities. There has also been enrichment planting done on 114 hectares by the wildlife authority with support from Mt. Elgon Regional Ecosystem Programme and the local community through Budwale Honey Enrichment and Development Project. “Farmers are also trained on soil conservation mechanisms like contour ploughing,” Chebet said. Abas Watuwa, the LC3 chairperson Bubiita sub-county, acknowledges that the livelihood of the people has greatly improved through selling what they harvest from the fertile forest land. He, however, notes that there is need to identify a sustainable and acceptable exit strategy by parties involved in the collaborative restoration to give a chance to the forest ecosystem to stabilise. According to Fred Kiiza, the Mt. 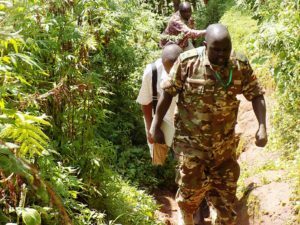 Elgon National Park chief warden, the collaborative forest restoration initiative has helped repair ties between UWA and the community residing near the national park. In the past, Kiiza says UWA engaged in running battles with residents who in turn accused the wildlife body of grabbing their ancestral land. At the height of the running battles that climaxed with 430 families in Manafwa District dragging UWA to court over what they termed unfair evictions, the Prime Minister in December 2015 met officials from UWA and leaders of the eight districts to forge a lasting solution to the persistent problem. Among the many resolutions made at that meeting was a recommendation to have the 1968 boundary re-opened to help ease the misunderstanding. And according to Kiiza, the ongoing boundary re-opening exercise has particularly been successful in Bududa because the communities have now recognised that the national park is the reason why they have reliable rainfall, enough firewood supply, herbal medicine and honey, among others. The Uganda Protectorate gazetted Mount Elgon National Park in 1929. In 1937, the boundary survey was completed but parcels were repeatedly degazetted to provide land for locals. In 1940, the area became the Mount Elgon Crown Forest and in 1951 a Central Forest Reserve. In 1983, the Ugandan government opened up a 6,000 hectare portion of the reserve for settlement by the encroaching Benet-Ndorobo group. The area legally remained a part of the reserve until 2002 when it was officially degazetted. Along the years, there has been a standing conflict between UWA, the core managers and custodians of Mount Elgon National Park, and the growing population of communities residing on Mt. Elgon who have been making claims on the park’s land for agriculture and settlement.